What do you do when you need to make breakfast, but you’re out of eggs, and you’re out of oats? 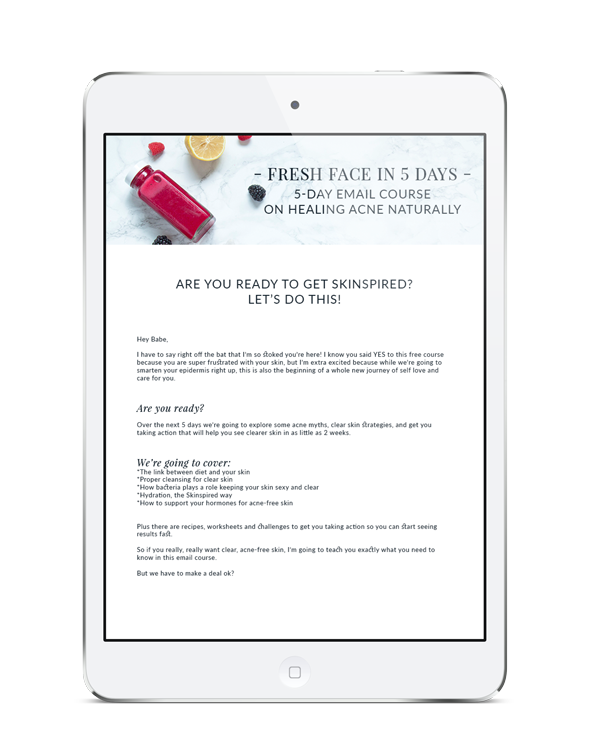 If you’re trying to keep your skin clear, you’re probably avoiding gluten (so most bread’s out) and dairy (forget that bowl of cereal). So what the heck is a girl to eat? 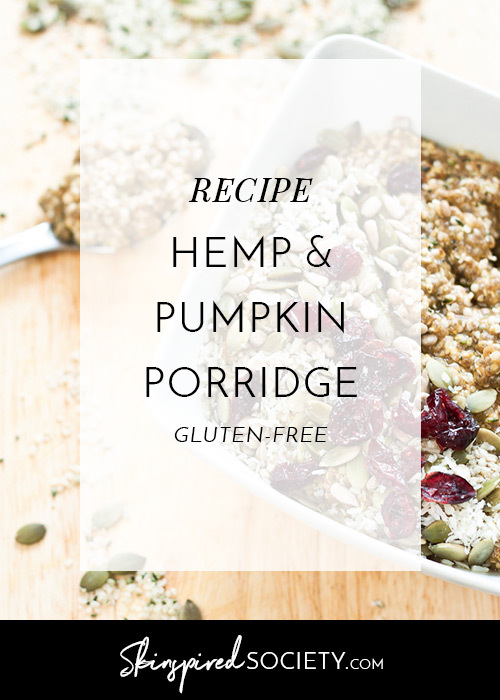 I highly recommend always having some hemp hearts in your fridge, so you can make this delicious hemp pumpkin porridge. Let’s take a moment and talk about hemp, and why I love it so much. 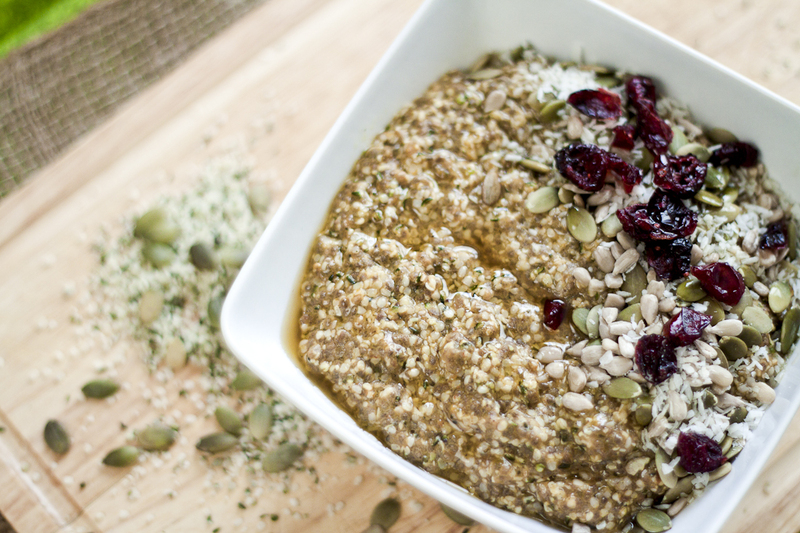 Not only does it taste delicious due to its mild nutty flavour, but hemp is also jam-packed full of nutrition. In fact, in just 30 grams of hemp hearts, there are about 10 grams of plant-based protein, and 10 grams of Omegas 3 and 6. Hemp hearts are also a great source of soluble and insoluble fibre, helping to fill you up, balance blood sugar, and bulk-up your stool so that you can have healthy and satisfying poops. Lastly, they are also packed with vitamins and minerals, including vitamins A, B1, B2, D and E, as well as the minerals calcium and iron. 30 grams of hemp hearts contains 10 grams of plant-based protein, and 10 grams of Omegas 3 and 6! Now being that it is autumn, and it’s pumpkin everything right now, I couldn’t help but get some pumpkinny goodness all up in this porridge. Not only does the pumpkin offer added fiber to this breakie, but it’s also creamy and pairs nicely with those familiar warming spices like cinnamon, ginger, nutmeg and clove. Another amazing thing about this porridge is that it is easy and fast to make. So throwing it together in the morning is no problem at all. However, if you do cherish that extra 10 minutes of sleep-in time, you could make this the night before, and then simply re-heat with 2 tablespoons of coconut milk either in the microwave (faster method, but less ideal), or on the stove (slightly slower method, but healthier). 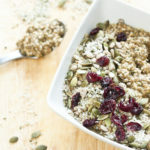 A delicious grain, gluten, and dairy-free version of porridge. 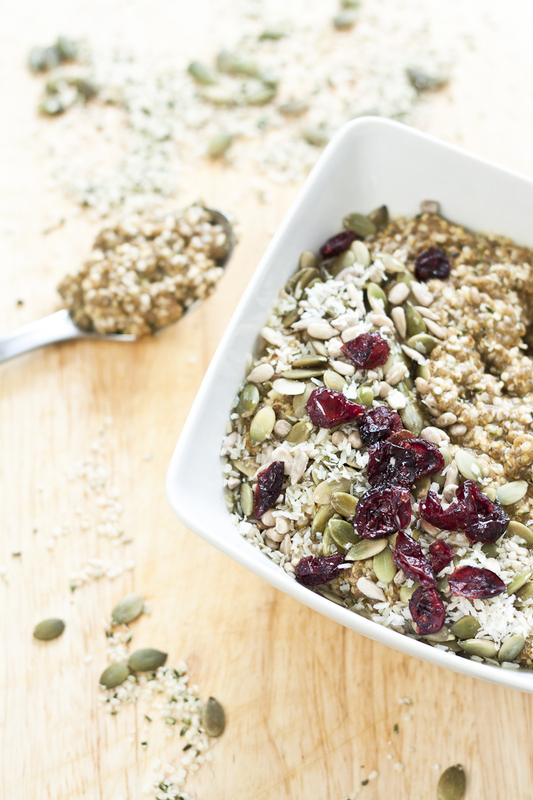 Start by measuring out ½ cup of hemp hearts, and adding them to a medium sized pot. I personally love Manitoba Harvest Hemp Hearts, and I get mine at Costco because it’s the best value that I’ve found. If you don’t have a costco membership though, you can order them online here. Next, Add 1 cup of nut milk (I used coconut), 3 tablespoons of chia seeds, and 3 tablespoons of pumpkin puree. Bring to a slight simmer over medium heat, stirring constantly to incorporate the pumpkin. 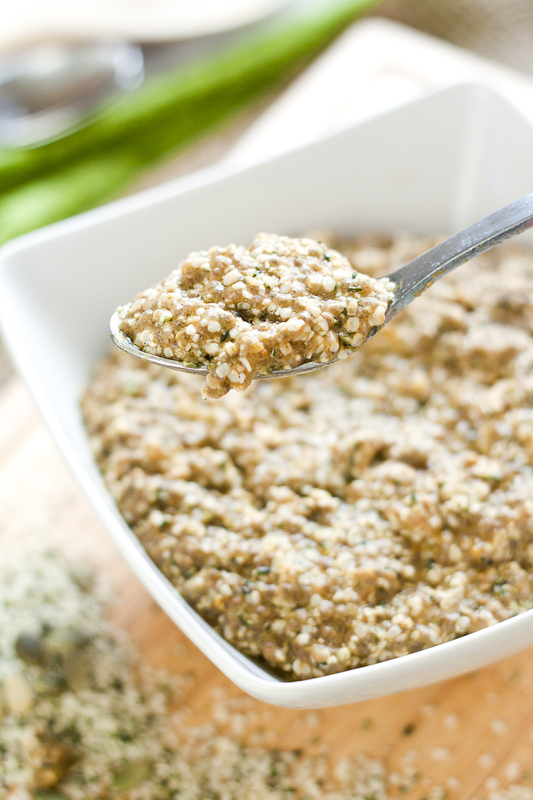 As the hemp and chia seeds take on the liquid from the milk, the porridge will thicken. Add spices to your liking. I liked to add in about ⅛ teaspoon of vanilla powder (you can also use ½ teaspoon of vanilla extract), and 1 teaspoon of pumpkin pie spice (when I’m having a lazy morning), or a combination of ½ teaspoon of cinnamon, ¼ teaspoon of nutmeg, a dash of ginger, and ⅛ teaspoon of cloves (when I’ve run out of pumpkin pie spice). 3-6 drops of alcohol free liquid stevia will help sweeten this baby, and a pinch of sea salt is always nice to throw in as well. Lastly, I love to kick up whatever I’m eating with some healthy fats. Feel free to either throw in a tablespoon of grass-fed butter, brown-butter ghee or coconut oil. If you have trouble with dairy, or difficulty digesting fats, I recommend that you stick to the coconut oil, as the medium chain triglycerides in the coconut oil allow the fats to be used immediately for energy, without needing to be processed by the liver first. And voila! I’m a crunchy texture kind of girl, so I’ll often throw in a handful of pumpkin seeds and sunflower seeds on top to finish ‘er off, but this is completely optional.